Hello lovely ladies and welcome to the house of madness ! 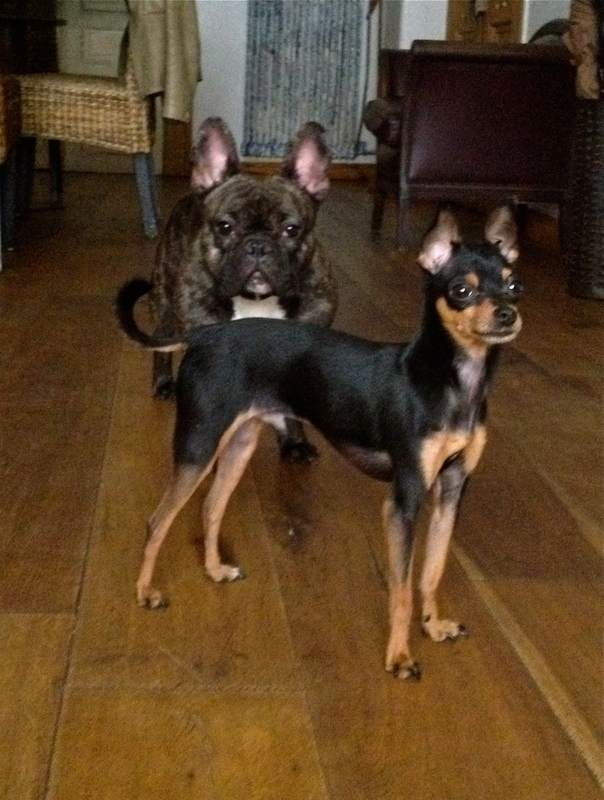 Yes the chaos continues here at the Pap residence which is why am a little late posting. I’m in the process of moving my craft room back home and have been busy plastering,painting, scraping and modge podging not to mention carrying tons of my crafty stash from one place to the other. Although my studio is close to home it’s a pedestrian area so no cars allowed great for the environment….bad for my back and shoulders and all my other bits. Onto the matter at hand and time for our second tag challenge over at Get Creative, we had such a great response to our first one and I do hope you will all join us again, it was fantastic to see so many familiar faces. The theme for the whole month of May is flowers and as I mentioned on my last post although I love them I’m just terribly challenged when it comes to creating with them. Once again I had very limited supplies due to everything being boxed up so here goes….. 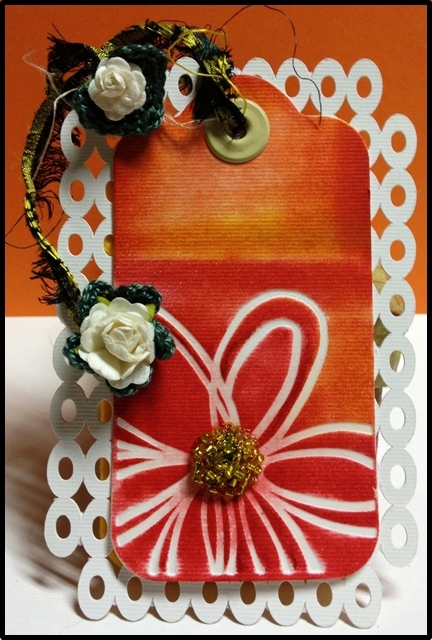 I once again made a double side tag using my Fiskars Fuse to cut and deboss it, I added Versamark to the flower to use as a resist I then sponged over the tag using my magic foam and various Adirondack inks. Tiny golden seed beads used in the centre and some lovely hand crocheted flowers that I was generously supplied with by our leader and this months sponsor Irini For the reverse of the tag I used this pretty thick felt which I cut de-bossed and inked up and passed it through the Fiskars Fuse. It’s a great machine and does all three steps in one pass. I really love the effect of the ink and de-bossing here. Not to leave my lovely Cameo out I cut some 350gsm card stock with this holey pattern and sandwiched it between the tags and there you have it. Once again please forgive my lack of visits but hopefully things will be back to near normal within the next week or so , well as normal as they can ever be in this house. Over at Get Creative we have a few changes for you and one of them being the introduction of a new challenge theme. I am delighted to announce that every 15th of the month we will be having a tag challenge. I was so excited when I heard this as when I first starting my crafty endeavours tags where the first things I made and I thoroughly enjoyed making them. So as it is our first ever tag challenge you have free reign to create whatever you like so no excuses lol ! This is a double-sided tag and I had so much fun getting inky and messy so much so that I made about ten of them ! A few months ago I bought the Fiskars Fuse Creativity system which for those of you that haven’t heard of it is a 12 x 12 die- cutting machine that can cut,letterpress and colour all at the same time. It’s a monster of a machine but it really does deliver. I firstly cut the tags and then coloured them with a variety of inks and a sponge, then passed them through the Fuse once again to deboss them. I then went over the debossed area with more inks and did a little stamping with some Archival ink. I made the butterflies from some of the other tags that I had made. I can honestly say I really enjoyed the process and quite like the result. So no moaning and whingeing from me for a change. We would love to see you join our first ever challenge at Get Creative so why not pop over and see what my fellow team mates have come up with to inspire you all. 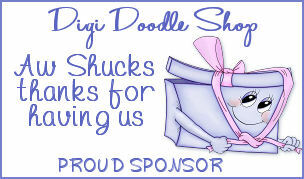 We are once again sponsored by Get Creative Embellishments . Helloooooo you lovely crafters hope you are all tickety boo, fit as fiddles and such like. I myself have just had a bit of a tiff with a very sharp Sushi knife and instead of finely slicing my salmon have managed to slice the top off my finger. Needless to say the Sushi is in the bin , I didn’t think my dinner guests would appreciate the outrageous red colour ! I’m going to keep this short as am in a fair bit of pain and am sporting quite a large bandage luckily on my left hand……looks like my Sushi party has turned into a pizza party ! 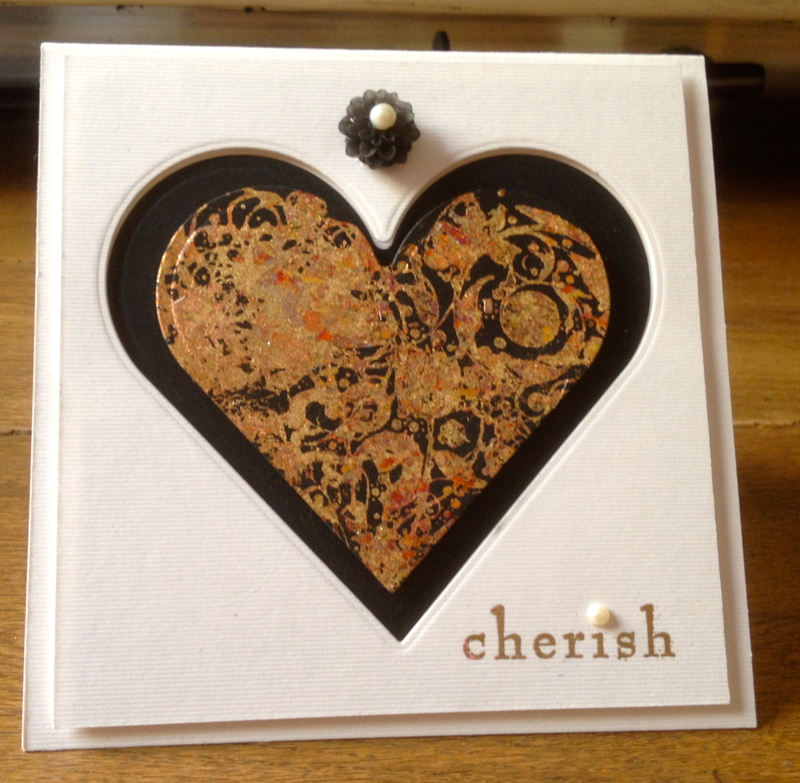 Its time once again for another challenge over at Addicted to Stamps and our theme this week is GOLD being a jeweller I just love working with the stuff so I made a couple of cards and here they are for your perusal. Looking back on some of my recent posts I’ve noticed that I am somewhat addicted to hearts of late and most of my cards feature them, please bear with me as I’m sure it’s a passing fancy . For this card I used the dreaded gilding flakes, I really love the effect but boy how I hate the mess, the mutts and I tend to become blinged up on the rare occasion that I use them and this time was no exception , even hubby got a little unexpected bling as he was quite curious about the process and stuck his finger in the flakes and sent them flying all around the house. He was really amused by it all and quite impressed I have to say until he went to work sporting a bit of the shiny stuff on his forehead. He phoned me a little later when he reached our shop to inform me of how gorgeous he looked !!! 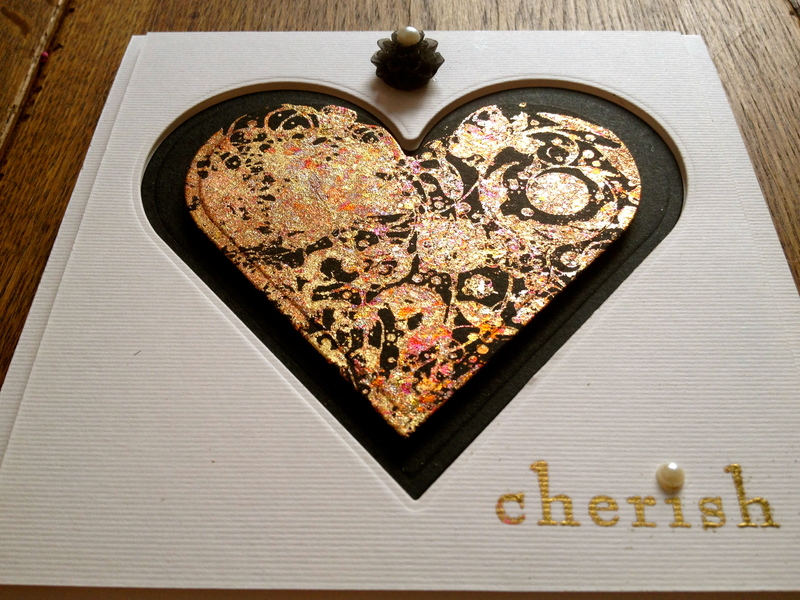 I used the Indigoblu heart stamp which I lathered up with flitter glue and then added the gilding flakes ….and well made a mess rubbing them into the glue and generally getting all sticky and blingy. I wont bore you with the rest because A. it’s obvious what I did next and B’ my likkle finger wreally wreally hurts . 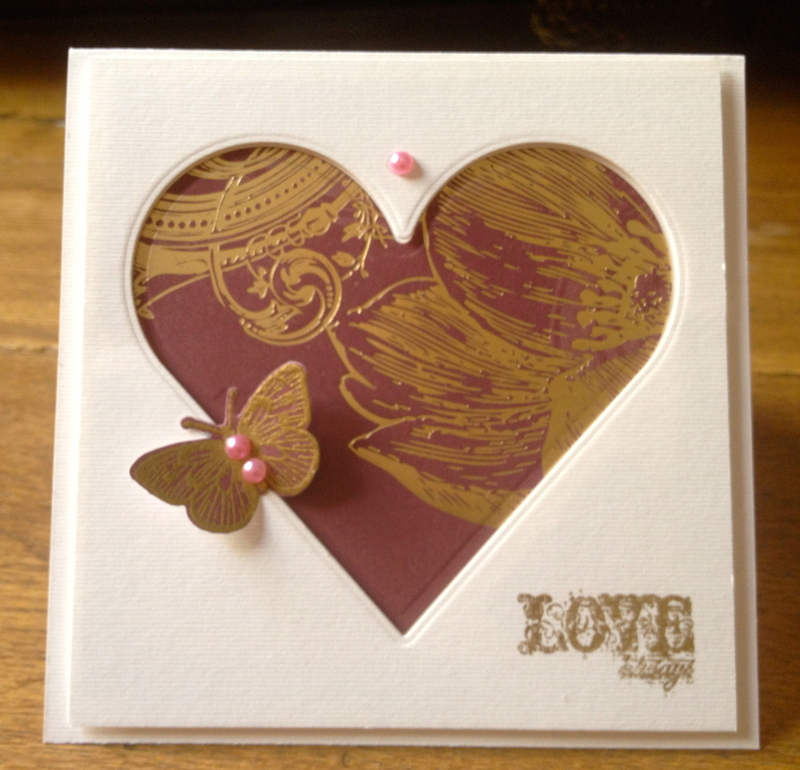 Stamped sentiment by SU with their lovely gold embossing powder . Yes I know another heart , your lucky I’m only sharing two as I made six variations on this card ! I used some gorgeous DP from a 12 x 12 paper pad that i have that was really expensive and fabulous and up until now I couldn’t bare to cut it up, of course the cover is hiding from me so cant tell you the name of its creators. 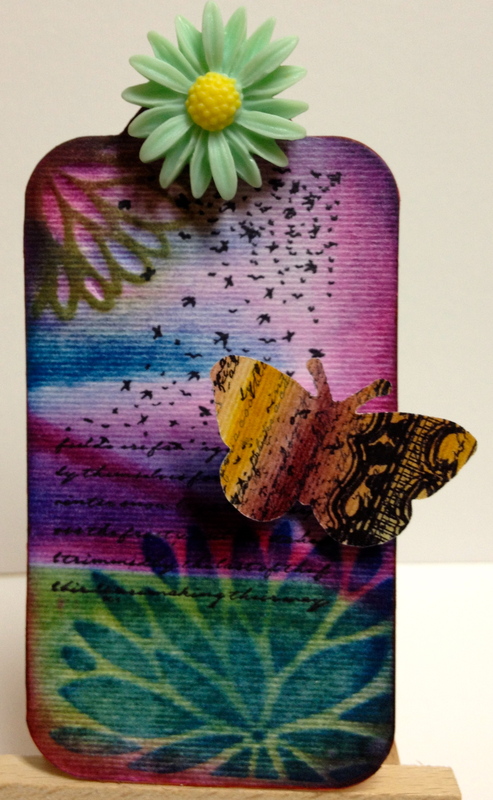 The butterfly is a Hero Arts Sizzix combo stamp and die cut stamped onto Rich Razzlebury card by SU and embossed with SU gold embossing powder and the same again for the sentiment. Thank you all so much for supporting us at Addicted to Stamps we are a new challenge and its great to see so many of you wonderfully talented crafters joining in. Not only that but my fellow DT members are amazingly talented and lovely ladies but dont just take my word for it pop over to Addicted to Stamps and see for yourself ! Right I really must go as I”m in dire need of medication for pain relief ( gin ) and my dinner guests are due any minute, he he they think they are getting Sushi , wont they be surprised when the pizza guy arrives . Time once again for our new challenge over at Crafty Cardmakers and our theme for the next two weeks has been chosen by the lovely and talented Feebsy who is asking us to Distress It ! 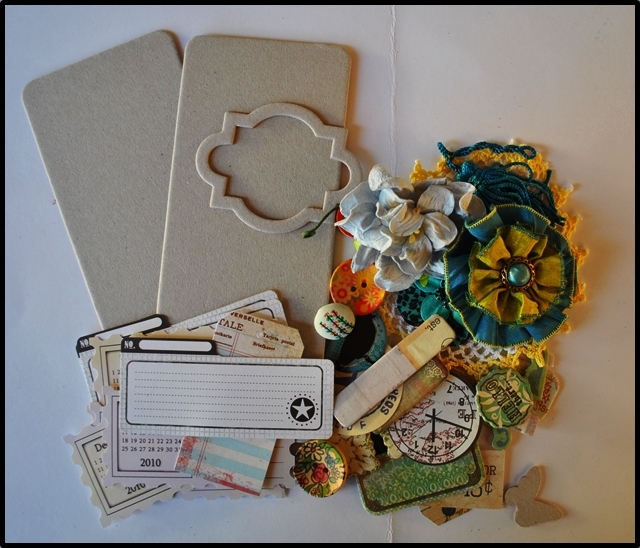 She would love to see some form of distressing on your project, pop over to Crafty Cardmakers for more details. I really enjoyed this one immensely and had lots of fun getting inky and messy , something I havent done for a long long time . To make the base I cut out three pieces of card with my Cameo and layered them, embossed them with the Harlequin embossing folder by Sizzix , lightly rubbed them over with Pan Pastels in varying colours and set them with hair spray, a double dose of UTEE to give a little shine and the base was done. For the next layer I used an IndigoBlu crackle stamp with clear embossing ink and the used the emboss resist technique with DI inks in varying shades until I got the look I wanted. The edges were distressed with my fab but very noisy Zutter machine and then more DI’s around the edges. For the main image I coloured a piece of card with Pan Pastels, over the top I stenciled in red Pan pastels a number mask that I had made with the aid of my Cameo. 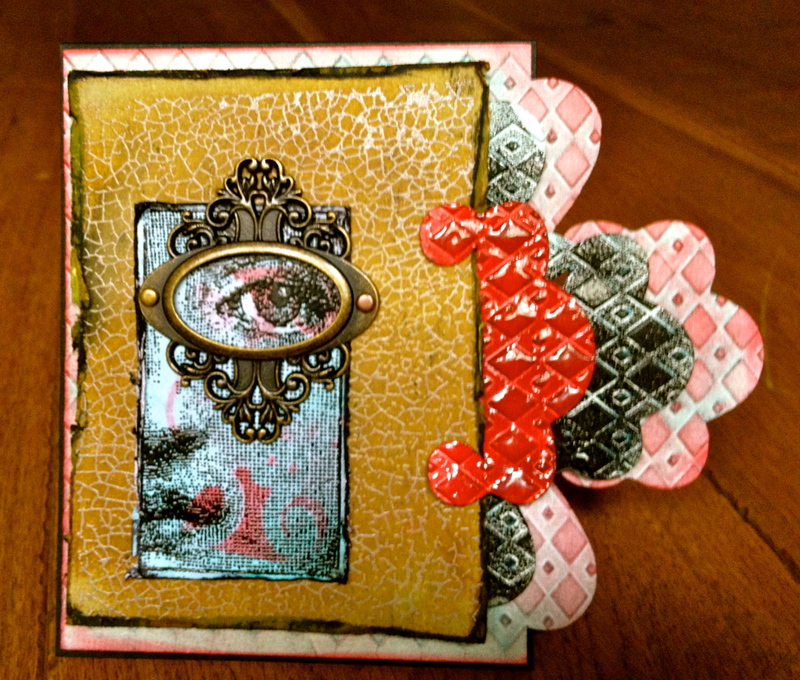 I used this great face stamp by Inkylicious which I embossed with black SU embossing powder. 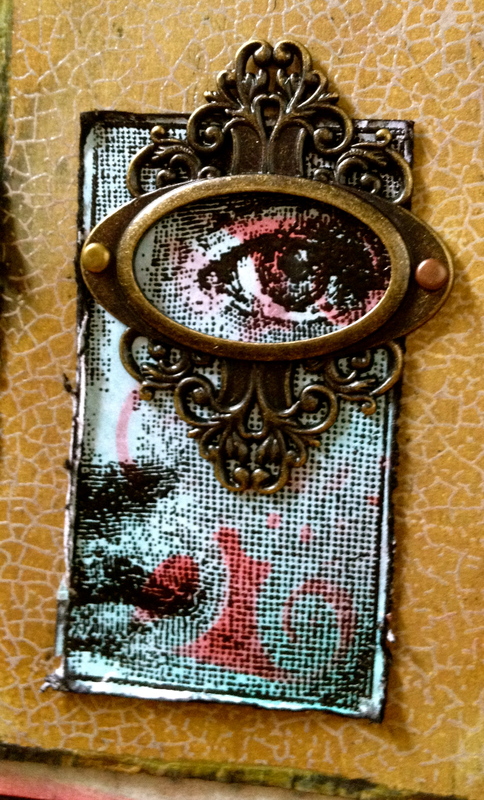 This little metal frame from Tim Holtz has been sitting waiting its turn patiently and seemed eyedeal ( pun intended ) to place over the eye. This was such great fun and I really enjoyed mixing it up a little. We are also sponsored by Hobby Art who are giving away two fabulous stamps sets and this is what they have to say. As a family business we’re a friendly, helpful, bunch at Hobby Art. All our stamps are designed by us and manufactured in Britain. 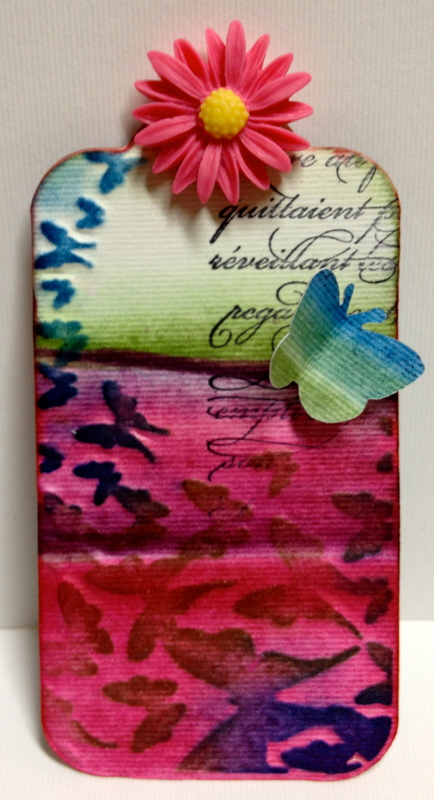 Look at the gallery on my blog – jennymayes.com – for lots of card ideas using the Hobby Art range. 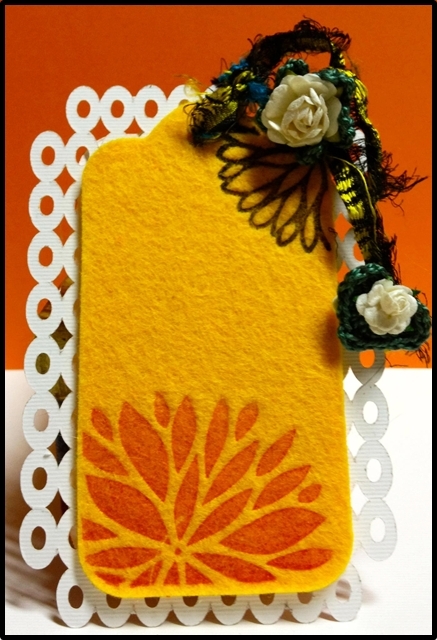 why not pop over to Crafty Cardmakers to see the fantastic inspirational pieces by my fellow DT members and why not take part who knows you could be one of our lucky winners ! Before I go would just like to leave you with a photo of Bailey and Rosy my doglets who have been complaining that I have not mentioned them recently in any of my blog posts ! Well the fact is that they have been behaving themselves lately and havent eaten or destroyed any of my stamps/supplies and creations. Right am off to cook lunch and will pop by you all later to see what you have been up to.